Sing Sensational is a spectacular collection of 19 flamboyant songs and warm-ups just right for an extravagant, energetic and exciting show-stopper of a performance! Available with Words on Screen™ v2. There Will Always Be A Reason To Sing, so packed into this songbook are 19 fabulous reasons to lift your voices and Sing Like Never Before! Sing your socks off with Music Makes The World Go Round, Our Time To Shine and Just For The Fun Of It before launching into some impressive part-singing in Shoo-be-doo-ah, a four-part round in Jazz Is Cool or plain craziness in I Got A little Dog*. And if it's concert repertoire you're after, there's a perfect Note To The Audience opener and a fabulously uplifting Encore! to close. So whether you're looking for fantastic assembly songs, showstopping performance songs or great choir numbers, this collection of absolutely Singsational songs has it all! S!ng™ is a fabulous series designed to get your school singing about almost anything and everything! Perfect for assemblies, choirs and group singing. Each book contains ideas and tips on how to get going, a few vocal warm-ups to prepare your voices and a whole mixture of irresistibly singable songs, featuring opportunities for rounds, harmonies and solo and group-singing. 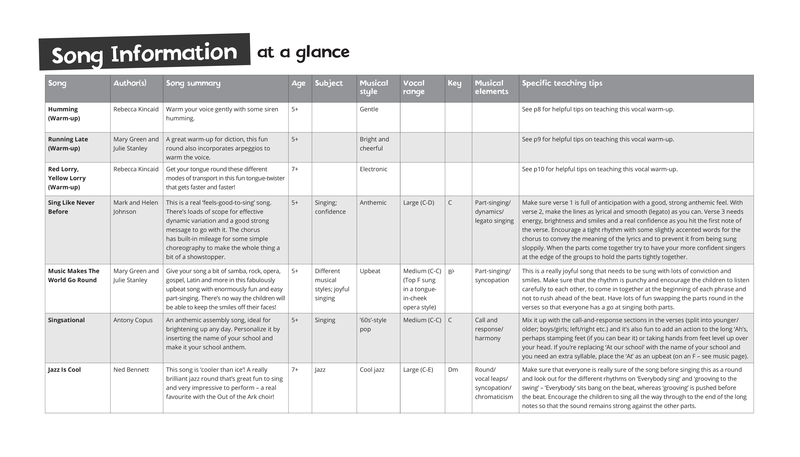 With a song chart giving all the vital information you'll need for each song, it's easy to choose an appropriate song for each occasion at a glance. Sing – Just Because We Can! Sing — Just Because We Can!